A track-by-track guide to the new Duran Duran album. 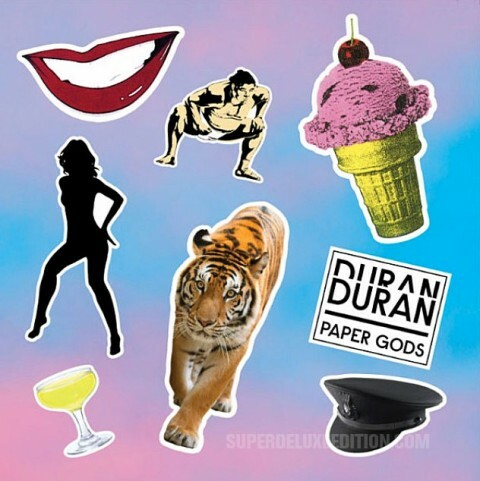 Duran Duran keep putting forward the suggestion that this album somehow channels the spirit of Notorious, but Paper Gods contains nothing as sophisticated as A Matter Of Feeling, as direct as Hold Me (with its brilliant middle eight), as funky as So Misled or as moving as Winter Marches On. And they are four Notorious album tracks, never mind the ‘hits’. It pains me to bring this up, but does Simon Le Bon have anything to say anymore? A simple B-side like We Need You (from the Skin Trade single) moves me a million times more than ANYTHING on this album. And I want to be moved. I want to feel something. Give me something that connects – Big Thing’s The Edge of America is far superior to The Universe Alone if we’re talking about epic ‘I’m all alone’ album closers. At its core, Paper Gods houses a good half-dozen completely forgettable tracks including, You Kill Me With Silence, Face For Today, Danceophonia, What Are The Chances, Sunset Garage, and Change The Skyline. To borrow a phrase from Armando Iannucci’s Veep, these amount to little more than ‘noise-shaped air’. Meaningless, inane lyrics, uninspired melodies, and music that half the time sounds like the band stayed at home. Can anyone pick out a great Nick Rhodes ‘moment’ on the album, like the piano phrase from Too Late Marlene, or the famous Save A Prayer synth line. Did anyone smile listening to some standout John Taylor bass playing – like on Skin Trade? Duran Duran appear to be obsessed with their ‘sound’, their place in the world and ‘not looking back’ (except when they play the hits every night on tour). They do so much navel gazing in between EVERY album that they often forget to just get the basics right. Write some good songs. They also have a habit of doing something good (Big Thing, The Wedding Album, Astronaut) and throwing away all the hard-earned goodwill by then doing something a bit rubbish (Liberty, Thank You and Red Carpet Massacre, respectively). Even though I think 2011’s All You Need Is Now is rather overrated, it was a decent stab at embracing the classic Duran Duran ‘sound’ and putting the band at the centre of things. Paper Gods unfortunately maintains the pattern outlined above – the drop in quality is palpable. Like banks who offer the best mortgage rates to new customers only, Paper Gods doesn’t deliver much to the existing fanbase who are in their forties and fifties, but the album is transparent in its attempts to attract new, younger audience – hence the collaborations have to be advertised on the track names. Perhaps all the collaborations on Paper Gods will help Duran Duran shift units, deliver crossover appeal and make them more ‘marketable’ thanks to massive social media reach, but it doesn’t appear to make the songs any better. Back to basics next time, methinks. Paper Gods is out now. Я, конечно, может чего-то не понимаю, но почему You Kill Me With Silence всего лишь 1/5?